Decorate Me Pretty: Melbourne...U beauty! What if someone told you 'It's your time to visit Melbourne NOW!'? What's your first reaction? Well for someone who digs beauty, art & design in all its forms it's only natural to get over the top excited and want to jump off her third floor balcony forgetting the fact that she is missing wings. Yea..so I hope someone is there to stop me from the madness if the above mentioned statement pops in my inbox a month from now. A few years ago my cousins were staying in Melbourne and my Massi (Mom's sister) must have invited us over a million times. But owing to several things that were going on in our lives like school holidays would clash with Papa's work at times and something or the other would keep coming up at other occasions, so we never got to go. And then they moved! It's a beautiful spring morning, my husband(B) and I are sipping delicious coffee at a cozy cafe. 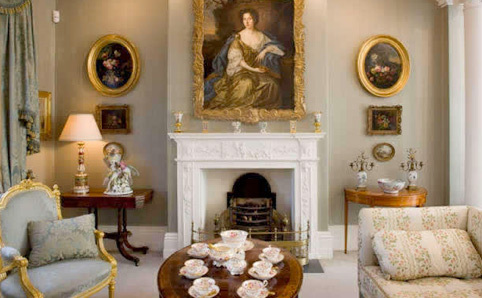 We finish with our yummy parfait and sandwiches and head straight to the Johnston Collection (museum) - belonging to Late William Robert Johnston, an antique dealer and collector. As our day is dedicated to museums and architecture this had to be an obvious choice for me to start. Housing a collection of 16th to 19th century decorative items, this place is remarkable and notably an inspiration for futuristic designs. While taking in every bit of the display breath by breath and daydreaming about how i'd re-dress the place if given a chance one day (which by the way was a tradition started by Johnston himself), I try not to catch up with B who is already on the other end of the room. The next stop is the National Sports museum where B and I seem to have interchanged our enthusiasm & pace. We follow this up with visits to Old Melbourne Gaol, Old treasury building, Melbourne museum, St. Patrick's & St. Paul's Cathedrals, Flemington Heritage centre and some click-click with frequent stops at some cafes & restaurants on the Brunswick Street. We are at the federation square and a street artist accompanied by a couple of more people meet us here. What are we in for? 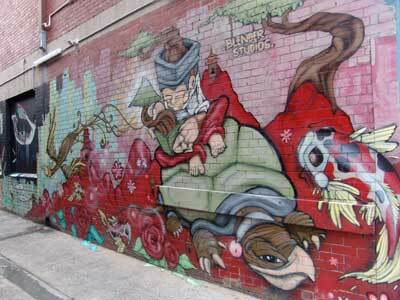 Today we check out the Melbourne Street Art scene. As we move from alleys to arcades in the city, our guide who is a local street artist explains the relevance of art forms drawn on the streets. This avant-garde art is an expression of various artists and not frivolous graffiti. Be it an opinion on a political issue or an environmental issue, it's all there. At the end of 2 hours we reach The Blender Studio. It is a massive structure where we watch artists at work. We chat up some of them while sipping good wine and this great journey comes to an end. My mind feels like a white wall which has been sprayed on with thoughts of different artists as I leave the studio, I know I'll apply them somewhere someday. It's late in the evening, I have my party shoes on and we are ready to hit a hip club in the city. Time to experience the night life at Melbourne. Its the day I had dreamt of many a times while doing the daily round of my favorite blogs. 9 am, seated in a comfy spot at a studio, Abigail Ahern is about to begin her Master Class at Melbourne. I am ecstatic and can hardly contain myself. As I listen to the inspiring ideas that she shares I am even more intrigued than the first time I read her blog. The way she talks about the use of colors and objects , it makes me feel like I'm in a different world and never had I imagined things in this way. She finally spares a few minutes to have a quick word with me personally, I tell her how I love reading her blog everyday and try to ask as many questions possible. I think of the nights ahead which I'll spend dreaming about this day. The day is about to break out, B & I can hardly feel our heads with excitement. Its our first hot air balloon flight ever and we cant wait for it to take off. My heart is pounding as my phobia of heights takes over but I also know B will somehow make it go away as always. 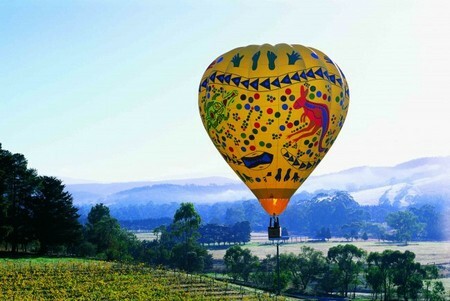 We can now see the Yarra valley and the vineyards beneath us as we sip champagne. This is going to be one of the most memorable breakfasts of our lives. Loved your post, Misha. And you have a nice blog too. Good luck for the contest. Wow! you've painted such a vivid picture with your words - and the pictures add to the overall feel. Lovely!! All the best. Thanks Nirvana! Great to hear from you. And wish you the best too!